If you're passionate about off-piste skiing, only the number of descents outside the marked pistes count when choosing a ski holiday. Reserved mainly for skiers and snowboarders with a high level of technical skills and good physical condition, off-piste skiing offers the chance to discover the mountain differently: the deep mountain countryside, away from crowds and noisy ski lifts. However, not all ski resorts have a ski area that lends itself to off-piste skiing. 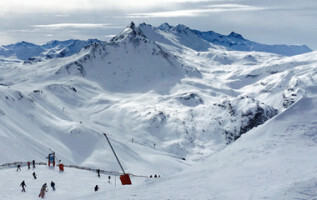 Therefore, we selected 5 French ski resorts particularly suitable for off-piste skiing. No selection of off-piste ski resorts would be complete without the legendary ski resort of La Grave La Meije. In the heart of the Oisans mountain range, in a high altitude setting that is both majestic and intimidating, La Grave has long been THE off-piste destination in France. In fact, this resort offers only one marked ski run on its glacier, the rest is a vast powder playground with cliffs, couloirs and wide open spaces where you will leave your tracks in the fresh powder. The reason that this high-altitude off-piste ski area stands out from the crowd is that the whole area is secured. It’s almost like a classic ski area that the piste-bashers forgot to piste! Are you ready to spend a full week off-piste without skiing on one groomed piste or man-made snow park? If you are, then La Grave is the right ski resort for you! For those who want to enjoy a real off-piste experience without having to trek miles into the wild, far from civilization, the French ski resort of Les Arcs offers an interesting combination of both off-piste and on-piste skiing. The off-piste possibilities are almost endless, but you will never be far from the marked pistes. Les Arcs is also a charming resort, with great facilities for less experienced skiers and young children. With ski lifts reaching 3226 meters at the top of the Aiguille Rouge and 3417 meters at the top of the Bellecôte in La Plagne, the Paradiski ski area offers seemingly endless off-piste routes with some classic favorites such as the Grand Col and its 1700 meter vertical drop! Tignes is hard to beat in terms of latest alternative winter sport options. Whether you enjoy freestyle in the snow park or off-piste skiing in wild, secluded areas, you will be over the moon in Tignes. Pioneering French off-piste skiers such as Guerlain Chicherit and Marie Martinod have gone through many skis and snowboards on the off-piste terrain of the Espace Killy. In addition to its well-known off-piste routes that can be practiced in the company of a trained guide or ski instructor, Tignes can also boast several areas dedicated to off-piste skiing within its marked ski area. These consist of 9 “Naturides” (marked black slopes, secured but not groomed) such as the Golf, Aster or Aiguille Percee. These Naturides are perfect for those who want to venture off-piste for the first time and gain confidence while staying in safe conditions. Chamonix: high-altitude off-piste skiing for the pros! The legendary couloirs of Chamonix, honored in the Cham'Lines videos by Aurélien Ducroz, await only the most advanced freeriders this winter. And we really mean ONLY the most advanced off-piste skiers and snowboarders as here we’re talking about the steepest and most technical off-piste runs in the French Alps. This is a very unique environment where only the best skiers and snowboarders, fully equipped (with harness, ropes, shovel, probe and avalanche transceiver), can venture. Chamonix is often the choice of those who have already made the rounds of what most ski resorts have to offer in the off-piste department! However, Chamonix does offer some wonderful off-piste skiing accessible to good intermediate and advanced skiers with famous routes such as the Vallée Blanche, an off-piste experience which doesn’t present any particular difficulty and is the longest off-piste route in France. However, you must hire a guide, have plenty of stamina and have a basic knowledge of off-piste skiing techniques to really enjoy the Vallée Blanche! Who said off-piste skiing could only be practiced in the Alps? Connoisseurs will quote you numerous routes and outstanding off-piste skiing in the Vosges region and in the Massif Central in France but we mustn’t forget the Pyrenees. At Barege you will find the iconic mountain, the Pic du Midi in the Grand Tourmalet ski area. At the top of the cable car that takes you effortlessly up to 2876 meters, several mythic off-piste routes await freeriders for more than 1500 meters of vertical drop when conditions are optimal. When you know that over the last two seasons, the Pyrenees had the most fresh snow in Europe, it could be worth considering booking your next ski holidays in the Pyrenees and trying some of the outstanding on and off-piste skiing there! If you know any other off-piste hot spots, let us know... Leave a comment here or join us on Facebook! And don't forget you can vote for your favourite ski resort and maybe win a ski pass for your next ski holidays! Vote now! Being lucky enough to have parents who were crazy about skiing, my love for the mountains started when I was 4 years old on our first family ski holiday to Austrian ski resort of Obergurl. One ski holiday a year was never enough and tears rolled down my face as I looked out the back window of the car on the drive down the valley on the way home!